Salads are rarely, if ever, craved. 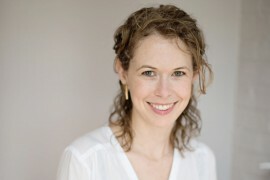 However, the salad’s more nutritious, filling, and flavorful cousin, the healthbowl, which typically offers a mix of greens, grains, veggies, and proteins, can be a menu’s star attraction. The bowl is to the salad as Will Smith is to Carlton Banks, as Superman is to Clark Kent, as Maverick is to Goose, and, like these iconic duos, is not a new phenomenon; rather, it’s a resurgence of a 1960’s food fad that has gained traction among food establishments seeking to please their health-conscious clientele. 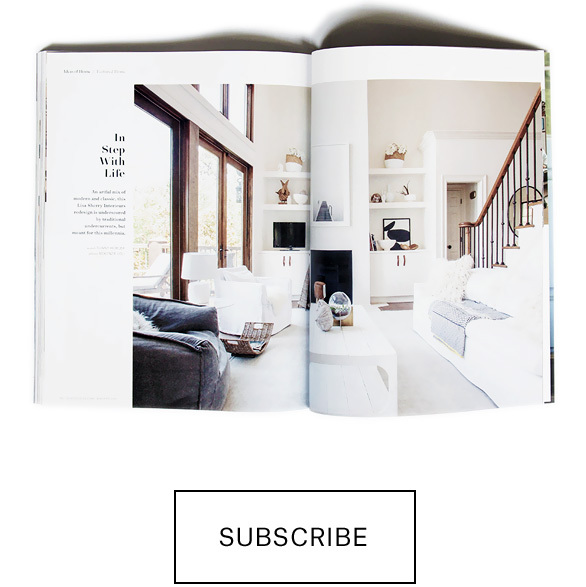 The Lights refuels diners in a space that looks as chic, modern, and refreshing as its trendy superfood servings. One such serving is their Moonrise Kingdom bowl, a standout on a menu brimming with tasty creations. 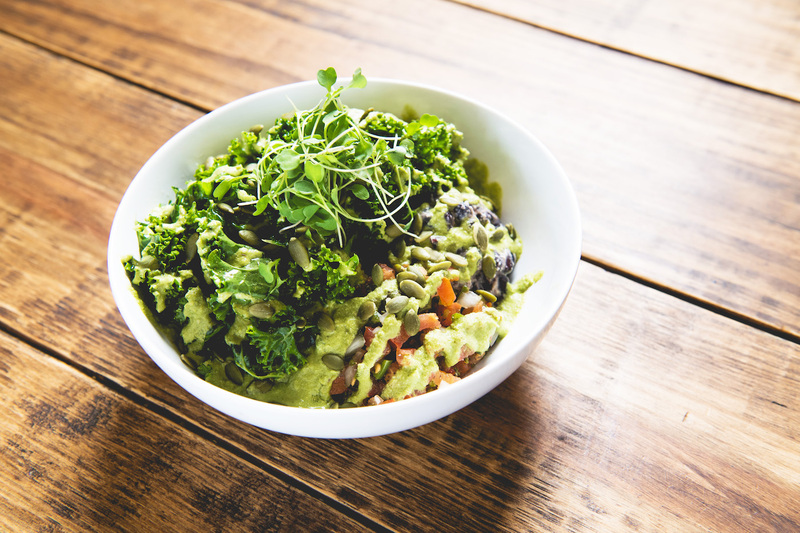 Black beans, cashew queso, marinated kale, avocado, tomato pico, pumpkin seeds, and verde sauce delectably gather over a bed of jade pearls or wild quinoa. 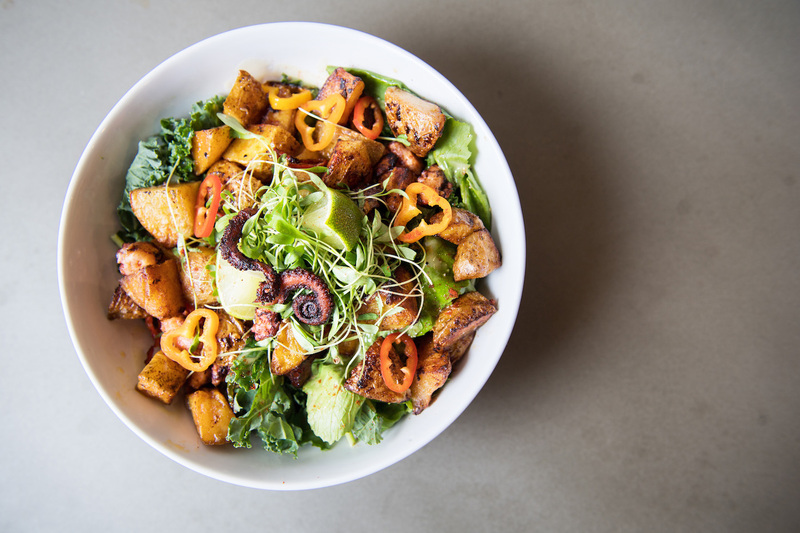 Not Just Coffee’s Dilworth location has elevated the traditional bowl with their refined Galician-Style Octopus Bowl, in which roasted potatoes, minced jalapeno, lime juice, and paprika bring out the satisfying notes of tinned Spanish octopus. The bowl’s capricorn of flavors is tied together by a bed of braising greens. You’ll want a fork and a hearty appetite for this one. Superica has been supplying South End with a steady stream of Tex-Mex since spring, dishing out heaps of their Ensalada de la Casa, a comfortingly classic combination of chopped greens, avocado, cucumber, pickled onion, corn, radish, Monterrey Jack, and crispy tortillas that can be topped off with wood-grilled chicken, steak, or shrimp. 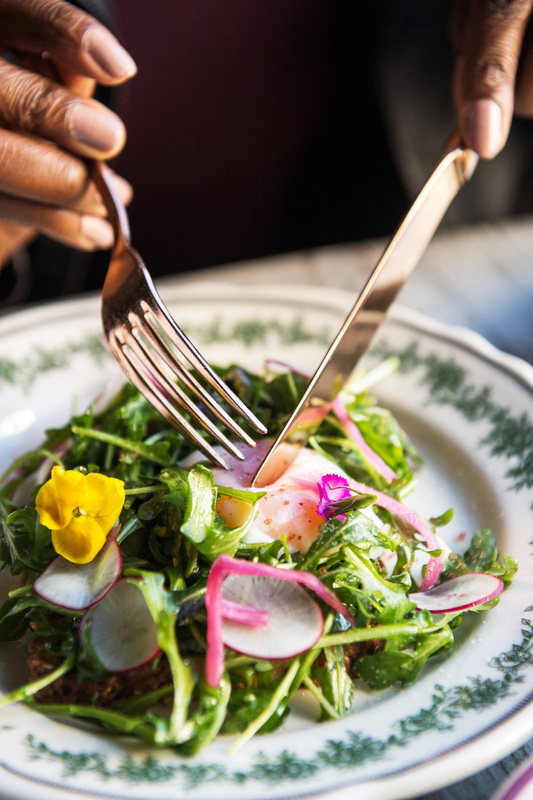 Stop by Haberdish during brunch hours for their morning take on the bowl: a mix of wilted arugula, pickled onion, crisp radish, edible flowers, and a poached egg. This leafy and almost-too-beautiful-to-eat concoction is an ideal midday breakfast follow up to a heavy late-night snack or can be consumed first thing in the morning for a dependable post-workout energy boost. Living Kitchen is South End’s first 100% plant-based, organic dining experience. 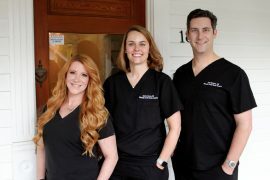 Their beautifully-dressed Arugula Harvest salad features arugula and purple cabbage topped with an impressive array of ingredients: sweet potatoes, avocado, pear, caramelized pecans and cashew-basil cheese. A splash of maple-mustard vinaigrette really brings all of these flavors together. This is a salad that deserves its place at the table. 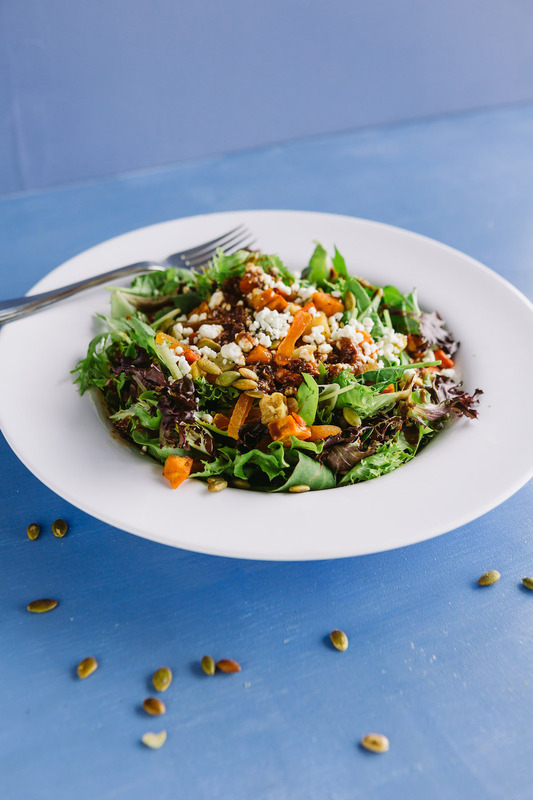 Dried Apricot, Pumpkin + Goat Cheese Salad — Amelie’s wants to raise your salad expectations by giving you unexpected combinations of flavor. Dried apricots, roasted root vegetables, and mixed greens set a strong foundation so the maple balsamic vinaigrette and goat cheese can steal the show. Topped with a crunch of pumpkin seeds, this is a seasonal salad you’ll be willing to wait all year for. 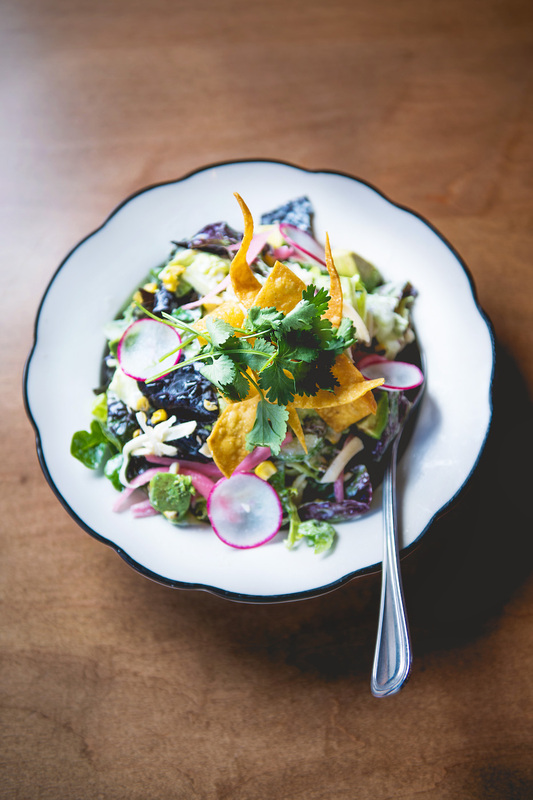 Amelie’s salads are all made in-house fresh, every day. 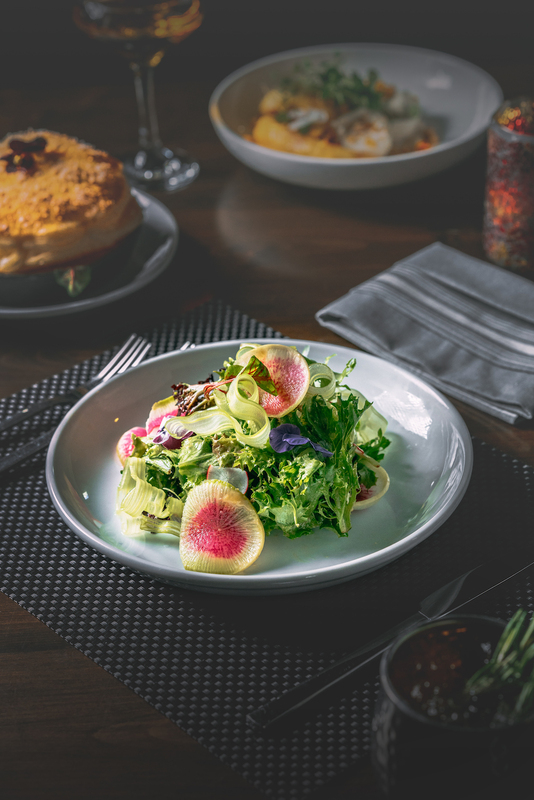 For a midday crunch, try their pear, bleu cheese, and spiced walnut salad. Fibrous mixed greens and sliced bosc pears make for a hearty dish and provide the proper balance for the stronger flavors of the celery seed balsamic vinaigrette, bleu cheese, and spiced walnuts. 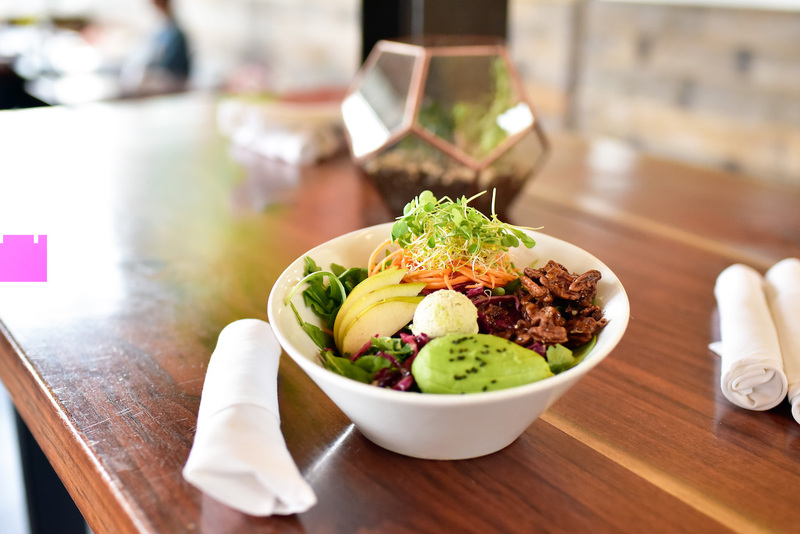 Tupelo Honey, the beloved Asheville-original that specializes in scratch-made Southern cuisine, is also home to one of the freshest salads you’ll come across in Charlotte’s South Boulevard. 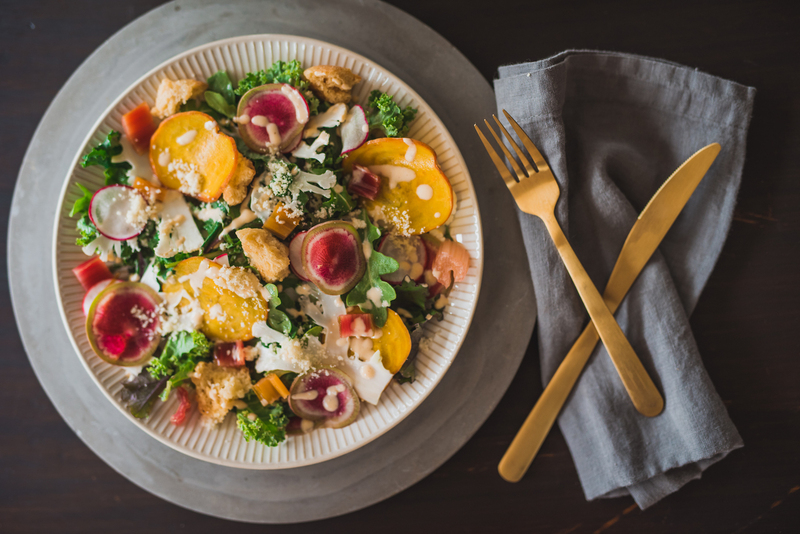 Rainbow Kale Caesar with thinly-sliced golden beet and watermelon radish mix well with flavorful butternut squash and cauliflower. It is topped off with grated parmesan and pumpernickel croutons. 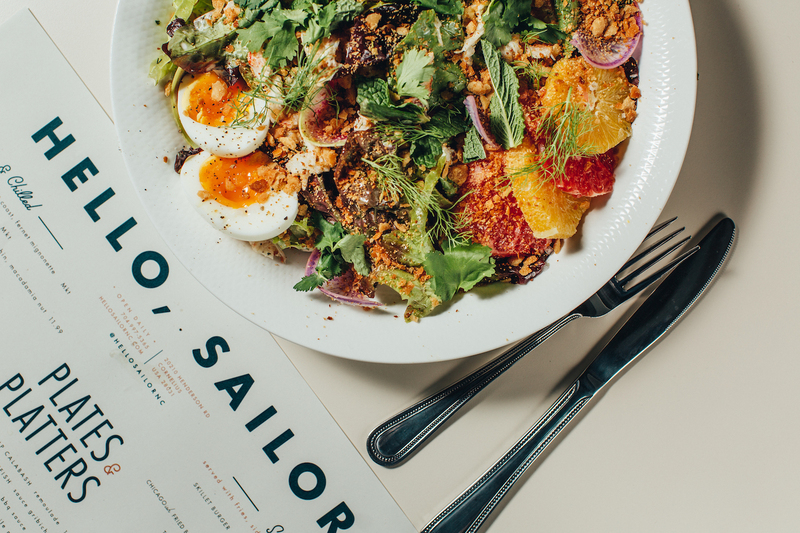 What’s not to love when you get to build a different salad each time you visit the casual-style Mediterranean Yafo? The BYOB option allows you to choose an on-the-go meal that’s hearty, warming, and delicious — it’s anything but a classic salad option, and that’s what makes it so dang good. 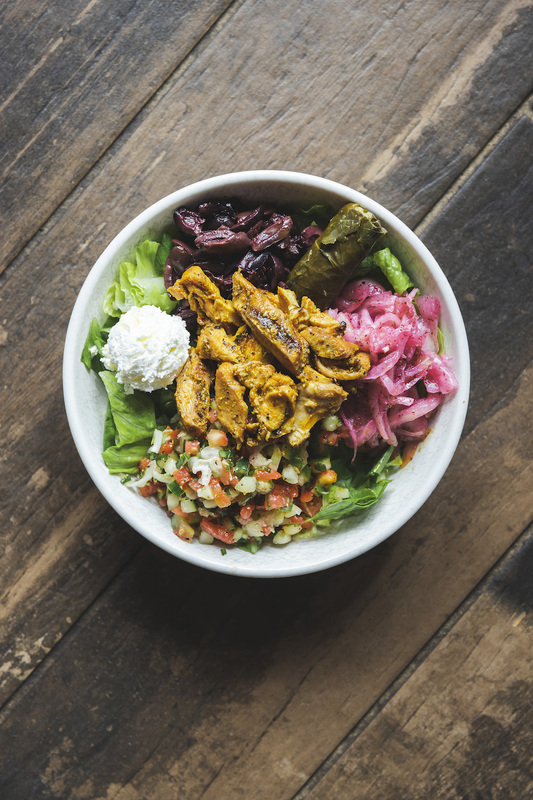 Start with a bed of greens and then have the Yafo chefs add your choice of a spread (hummus, tzatziki), toppings of nearly every variety, a protein (vegetarian, even), and sauce or dressing to finish the whole shebang off. 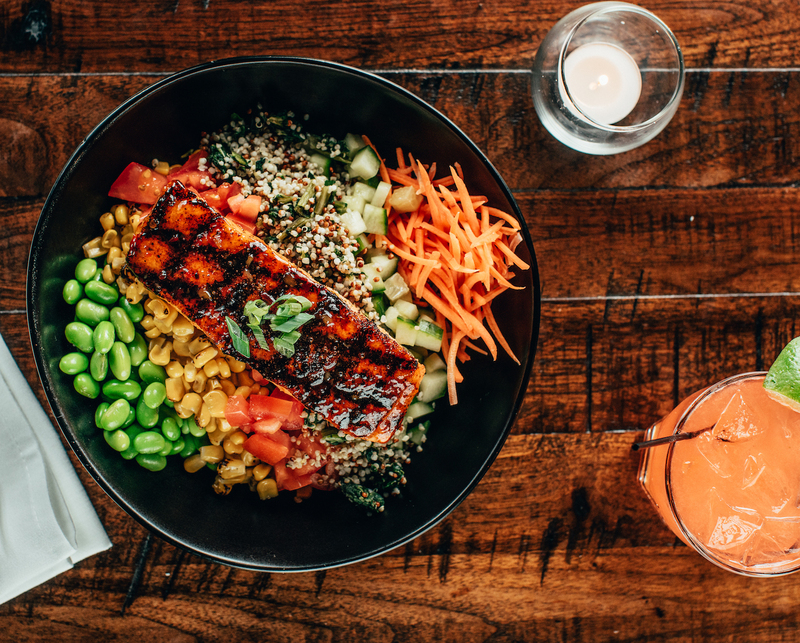 Duckworth’s Scottish salmon salad comes with lightly blackened fish, drizzled with a sweet chili sauce, and served atop a bed of mixed greens ribboned with charred corn, edamame beans, quinoa, carrots, cucumbers, tomatoes and a pinch of green onion. The dish comes served with a side of buttery chipotle ranch, for a meal that’s both hearty and healthy. Fahrenheit’s seasonal roasted acorn squash salad is something we look forward to all year: The rooftop restaurant dishes up a bowl that comes with the namesake roasted acorn, alongside a rich siano burrata, toasted chopped hazelnuts, and a just-sweet-enough maple glaze. We won’t lie that we usually head to Roosters for the more… meat-forward types of dishes, but the farro salad is unforgettable. Served on a bed of kale, this bowl is filled to the brim with pickled vegetables and Roosters roasted turkey, sprinkled with cranberries, Spanish almonds, and, Bulgarian feta. 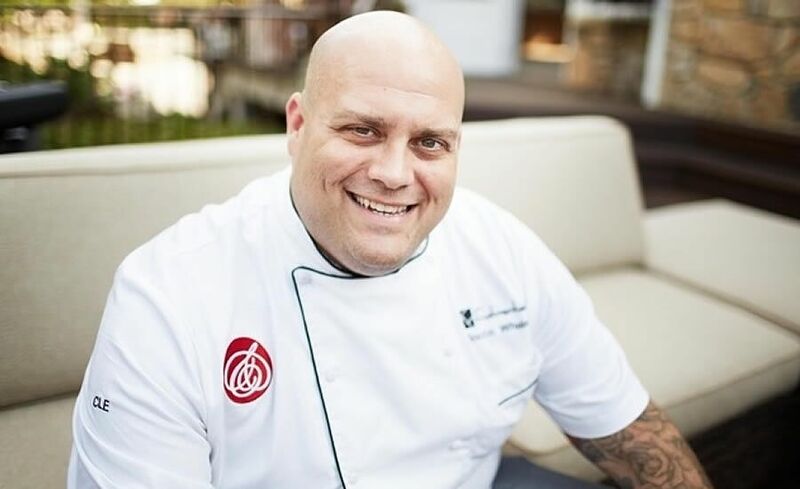 Seven Oak Cafe has an array of brunch, lunchtime, and dinner fare, easy grab-and-go option like salads, soups, and sammies, but the Southwest Cobb is a standout on the flavor scale. With lettuce, roasted pimento cheese, black beans, garden tomatoes, avocado, egg, and bacon, this is a zesty option that satisfies every time. Earl’s harvest salad is one of the best grab-and-go options around: the signature smoked farro, fresh roasted beets, kale, pickled onions and fennel, come topped with seasoned pumpkin seeds, feta cheese, currants, and Fresno chili vinaigrette. This is surely one of the prettiest salads around. Sailor’s unique citrus crab louie comes with fresh crab, slices of the freshest citrus fruits, cream avocado, an egg, and crunchy, salty, brown butter saltines. 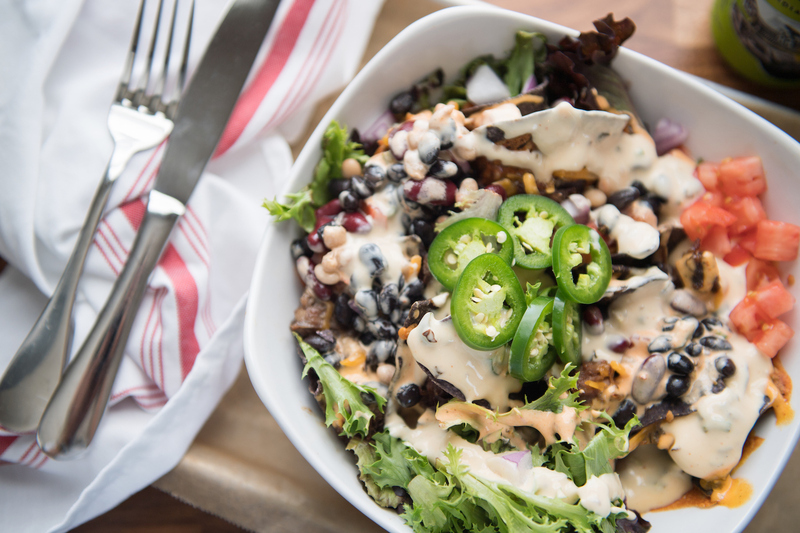 The vegetarian/vegan Fern has all kinds of fresh takes on salad classics. Their “Lolla Rossa” is about as “comfort-food” as a salad can come, with a bed of red leaf lettuce, pickled vegetables, and tomato that gets topped with their housemade crunchy-smoky-sweet coconut “bacon”, buttermilk vegan ranch, torn cornbread croutons, and the option to add vegan fried “chicken” or tempeh to make it even heartier.